The flu, short for influenza, is defined as, “A highly contagious viral infection of the respiratory passages causing fever, severe aching, and catarrh, and often occurring in epidemics.” Once or twice a year, these epidemics sweep the nation. We call this flu season. During flu season, it can seem impossible to stay healthy. Every surface you touch throughout the day could be infected, and your chances of picking up a bug are high. There are some measures you can take to protect yourself against sickness, as outlined in our blog Cold and Flu Season Advice. But sometimes, sickness is simply inevitable. If you find yourself with symptoms of the flu including fever, cough, sore throat, runny nose, muscle aches, headache, and fatigue, your best course of action is to hydrate. A common misconception about viral illnesses is that they require antibiotics to treat. The problem with antibiotics is they eradicate both healthy and unhealthy bacteria and disrupt the balance of the body. Antibiotics can also cause resistance which makes bacteria more difficult to treat in the long run. The truth is the body is well-equipped to deal with illness, and often only needs hydration and time to heal. Why is hydrating the best thing you can do for your body when you have the flu? Because the illness triggers physiological processes that cause dehydration. Symptoms like vomiting and sweating cause massive fluid loss, and dehydration, in turn, aggravates these symptoms. It’s a vicious cycle which is why the flu can drag on and on. Properly hydrating can shorten the lifespan of the flu by supporting the body’s basic functioning and flushing out toxins and metabolic byproducts. Therefore, IV infusion therapy is an excellent treatment option when you have the flu. An IV drip is the fastest and most effective way to hydrate the body, flush out toxins, and replenish nutrients and vitamins. In this way, IV infusion therapy works to rebalance the system and can greatly reduce the course of an illness. It’s never too early or too late to get IV infusion therapy for your flu symptoms. Whatever stage of sickness you are at, an IV drip works to rehydrate your body and bolster your immune system. 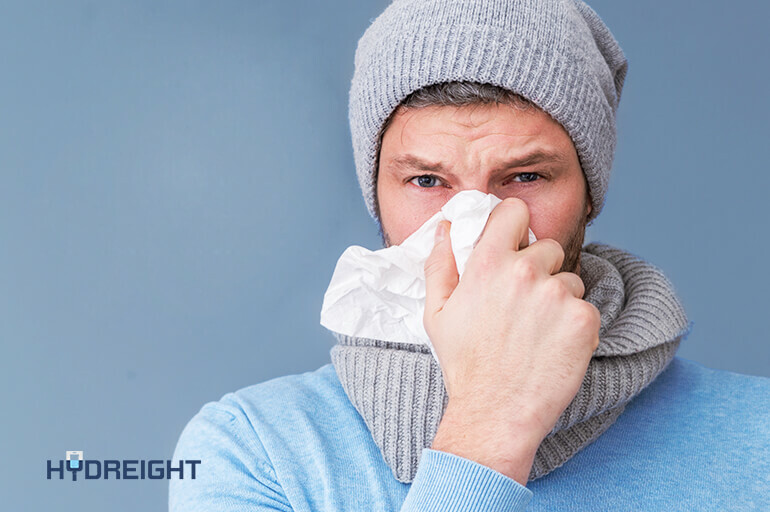 At Hydreight, we offer several treatment options to help you fight the flu. If you are feeling worn down, or are already experiencing symptoms of the flu, we recommend booking an IV drip right away. With Hydreight, it’s easy because we come to you. Simply download our app, and book an IV Specialist near you!